While studying at Enfield, Keats attempted to gain a knowledge of Grecian art from translations of Tooke's Pantheon, Lempriere's Classical Dictionary and Spence's Polymetis. Although Keats attempted to learn Ancient Greek, the majority of his understanding of Grecian mythology came from the translations into English. "Ode on Melancholy" contains references to classical themes, characters, and places such as Psyche, Lethe, and Proserpine in its description of melancholy, as allusions to Grecian art and literature were common among the "five great odes". According to Harold Bloom, one can presume that the "harmony was threatened if fully half of [the poem] was concerned with the useless quest after "The Melancholy". 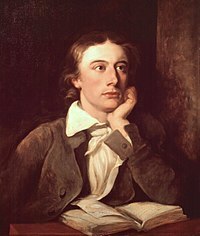 Despite its adjusted length, Keats thought the poem to be of a higher quality than "Ode on Indolence", which was not published until 1848, after Keats's death. "Ode on Melancholy" consists of three stanzas with ten lines each. Because the poem has fewer stanzas than "Ode on Indolence" and "Ode on a Grecian Urn", the rhyme scheme appears less elaborate, with the first and second stanzas sharing a rhyme scheme of: ABABCDECDE, while the third takes on one of its own: ABABCDEDCE. As with "Ode on a Grecian Urn", "Ode on Indolence", and "To Autumn", each stanza begins with an ABAB rhyme scheme then finishes with a Miltonic sestet. The general meter of the poem is iambic pentameter. Personification is implemented with words such as 'Joy', 'Beauty', 'Delight', and 'Pleasure' allowing the poet to create characters out of ideals and emotions as he describes his thoughts and reactions to feelings of melancholy. The difference between the personification of these words and those in the other odes Keats wrote in 1819 comes from the fact that while the poet describes them as human, he declines to interact with them. Keats himself fails to appear in the poem, which creates what Andrew Bennett describes as a separation between the author, the poet, and the reader. In Reading Voices, Garrett Stewart reaffirms Bennett's assertion that Keats's voice never appears in the poem itself when he says, "For all the florid staginess of his conceits, there is, in short, no mention of writing, of the melancholic as a writer." which he suggests supplies the ultimate case of a negative relationship because it suggests that the only true beauty is one that will die. But Thomas McFarland, while acknowledging the importance of the original first stanza to Keats's endeavor, openly praises the removal of the lines as an act of what he calls "compression". McFarland believes that the poem's strength lies in its ability to avoid the "Seemingly endless wordage of "Endymion" and lets the final stanza push the main themes on its own. By removing unnecessary information such as the reason the poet suggests the trip to Lethe, Keats allows the reader to avoid the "fancy" aspects that would have appeared in the first line and were not sustained throughout the rest of the text. The height of the joy, the moment when the world can improve no further, is both the end of joy and the beginning of melancholy. A climax implies a dénouement, and 'bursting Joy's grape' involves both the experience of ultimate satisfaction, with the powerful image of the juice bursting forth from a burst grape, and the beginning of a decline. In The Masks of Keats, Thomas McFarland suggests that Keats's beautiful words and images attempt to combine the non-beautiful subject of melancholy with the beauty inherent in the form of the ode. He too writes that the images of the bursting grape and the "globèd peonies" show an intention by the poet to bring the subject of sexuality into the discussion on melancholy. ^ Gaillard. Theodore L., Jr. "Keats's Ode on Melancholy." The Explicator. Sept 22, 1994.